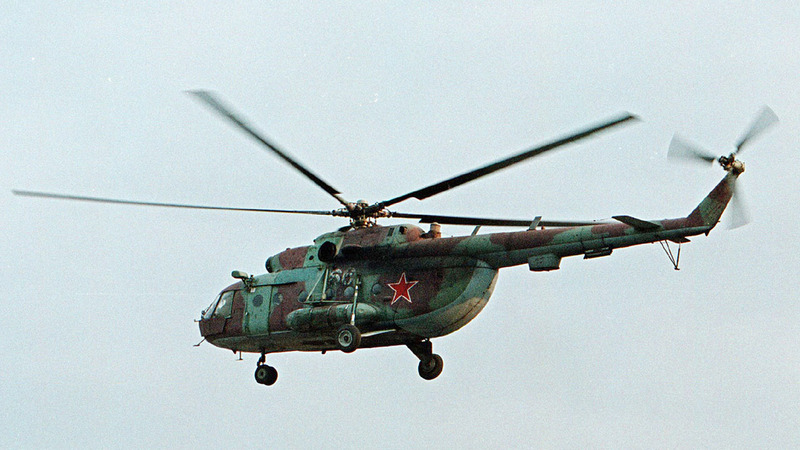 A helicopter similar to the one pictured has been shot down in Syria and Russian President Vladimir Putin's spokesman says all people aboard it have been killed. BEIRUT -- A Russian transport helicopter was shot down in Syria on Monday and all five people onboard were killed, the Kremlin said, in the deadliest single incident for the Russian military since its involvement in Syria's civil war. Idlib province has a strong presence of fighters both for the al-Qaida branch in Syria known as the Nusra Front and rebels. The group announced last week that it was changing its name and relinquishing ties with al-Qaida in an attempt to undermine a potential U.S. and Russian air campaign against its fighters. Videos uploaded online by Syrian opposition activists show the burning wreckage of a Russian helicopter. The footage was seemingly taken in the first few moments after the helicopter crashed. In one video, a rocket pod can be seen next to the wreckage. People standing nearby are seen taking cellphone photos and shouting "Allahu Akbar," or God is great in Arabic. The helicopter appears to have broken up as it crashed. In another video, its tail can be seen lying separately from the aircraft's body in flames. Monday's helicopter downing was the deadliest for the Russians since Moscow began carrying out airstrikes in Syria in support of Syrian President Bashar Assad's forces last September.